Today, my good friend Rene mentioned how she wants to bring back the 1980s Banana Clips and I couldn't help but chuckle. First it was my buddy Tracey and her silly EG Smith slouch socks. Now Rene will be shopping eBay for colorful Banana Clips (not to be confused with the banana seat bikes) for her side ponies. Did you own a Banana Clip in the '80s? 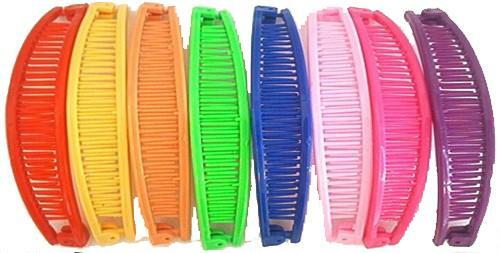 For those of you who are too young or too old to remember, Banana Clips were popular in the mid to late 1980s. Named after their obvious shape, these over-sized clips were used as offbeat ponytail holders. The hair comb type teeth kept the hair from slipping out while providing a loose ponytail. Unfortunately, I never had hair thick or long enough to sport one, most of the girls in class wore them in colors that matched their stirrups or leggins. To be honest, my most favorite hair accessory to this day are those braided ribbon clips made from different colored ribbons. Yes, 1983 was a great year! Click here to purchase a Banana Clip for $5. you are right, 1983 was a great year! It was the rookie season for Wade Boggs, Tony Gwynn, and Ryne Sandberg. Three hall of famers in the same "class." I wore these almost every day in elementary school. And they ALWAYS matched my outfit! And stirrups were awesome! I had lots of these, you can sometimes still find them at drugstores. They help make fawkhawks sometimes! Oh, I had some of these! They were perfect for my BIG HAIR! LOL! I wouldn't be caught dead with one in there now....I might be thrown in the fashion faux pas jail! OMG you can actually still buy banana clips? Those were hot when I was in 8th grade...1989. I totally forgot about the ribbon barrettes! When my sister wasn't looking I'd steal her Banana Clips and make pretend they were piranha fish. Yes, I'm pathetic. I still have a drawer full of them! I remember using my sisters to pretend they were bear traps. No joke. My mom would find them all over our backyard. I have seen a banana clip here or there lately-weird! I used to wear them, they worked better when I would curl my hair. I love the braided ribbon barrettes a lot more. those were awesome. Ok. Confession: I wore one to my high school prom. There. Ahhh yes... Banan clips. I loved the way my hair looked in those! If I'm lucky I'll still see someone sporting one. I have a love hate relationship with them. I loved them. Wanted them. Got them. They didn't stay in my freakin' hair!!!! I had some of these. I remember the yellow one that was my favourite because I had thick hair and it worked the best for this. I had a couple of the ribboned barrettes too.